The present gallery of medical technology has been developed during more than 30 years of vascular investigation and research. The drive for developing these units has been lack of availability of particular instruments and the need to improve existing techniques. These devices have been delivered to more than 100 hospitals, GP offices or research centres in Scandinavia and UK. Please contact us if some of these techniques can be of interest. MacroLab. Our third generation air plethysmograph, a combined 8 MHz ultrasound doppler unit and plethysmographic pulse volume recorder (PVR) - ideal for arterial investigations. The unit may also be used for measuring venous outflow in patients suspected of having deep venous thrombosis (DVT). 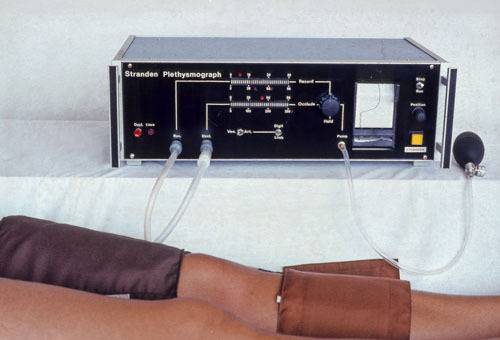 Stranden Plethysmograph. Our second generation air plethysmograph. 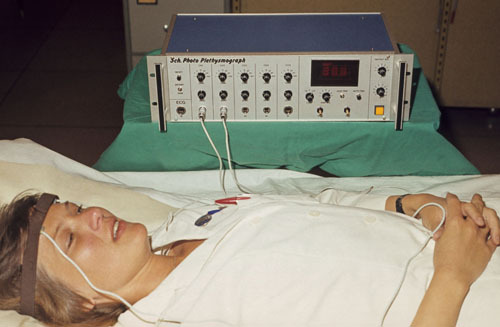 Stranden Plethysmograph. Our first generation air plethysmograph. 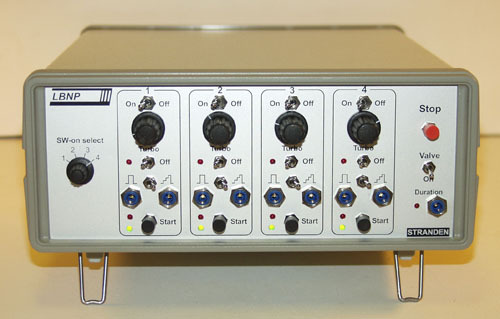 LBNP Control Unit. 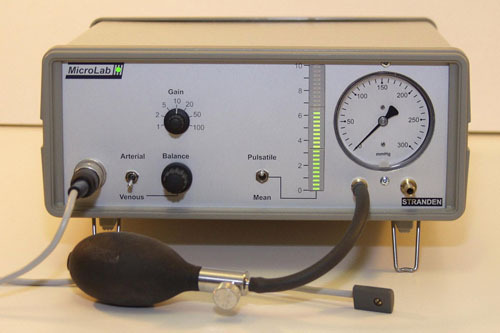 The Lower Body Negative Pressure control unit controls the application of subatmospheric pressure created by vacuum cleaners and applied to the lower body for studies on cardiovascular regulation and for shock simulation. Up to four different subatmospheric pressures may be applied, controlled either manually or by a computer. The main control unit also control peripheral units, such as the main safety and pressure recording unit (to the left) and the specially developed safety- and pressure reduction valve (to the right). These are attached to the LBNP chamber (below). Handgrip unit. 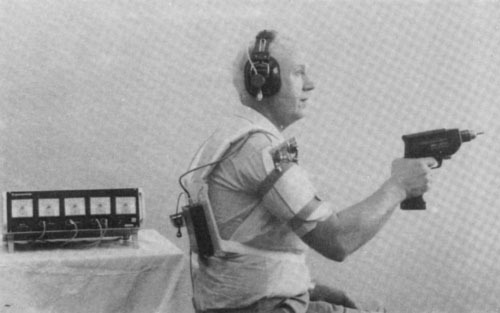 For studies on static muscular load a handgrip compression unit was developed. The applied muscular force is indicated in a digital display. 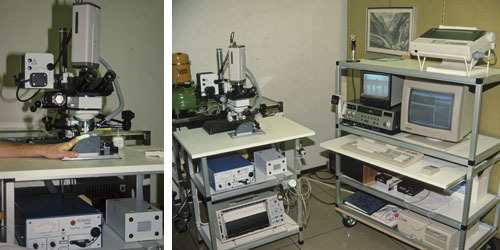 A laboratory setup with the LBNP chamber (old version), control unit, pressure monitor and other equipment is shown in the photo below. Octopus - Blister Suction Device. 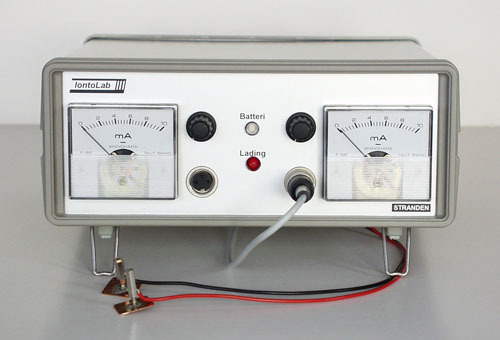 This unit was developed to create skin blisters and thereby easily accessible interstitial fluid for studies on interstitial fluid balance. The suction cusps are provided with a subatmospheric pressure of 200 mmHg, and blisters are normally formed after one hour exposure. OncoLab. 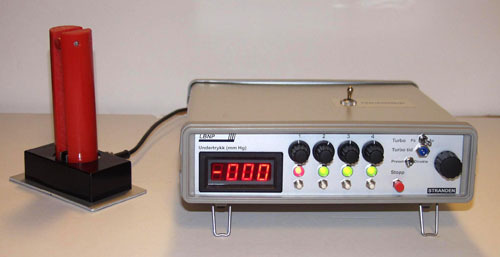 (previously "5 µL Oncometer") This instrument quantitates the oncotic (colloid osmotic) pressure of small fluid samples (5 µL), for instance fluid from skin blisters or when using the "wick technique" in studies of edema mechanisms. Video capillaroscopy. Much effort was spent to develop the microscope part of this investigation tool. Together with the Capiflow software system the capillary microscope has been used in a PhD thesis and several other studies on human skin capillaries. IontoLab. IontoLab is an electrophoresis unit that is used in the diagnosis of cystic fibrosis in children. MicroLab. 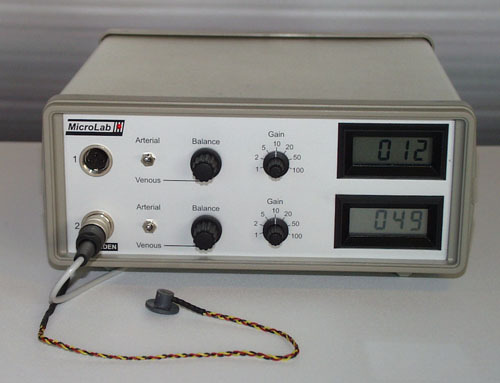 MicroLab is a photo plethysmograph is produced in several formats (1-5 channels) for human and animal studies. Animal experiments are, due to the high heart rate in some species, a challenge using units designed for human investigations. Our units may be custom designed to the different needs, and are found in research facilities in the UK (William Harvey Institute) and Sweden, as well as in Norway. MicroLab Toe Pressure. This unit was develop to meet the demand for measuring toe pressure - which may be of great value in patients with diabetes mellitus or arterial ischemia due to atherosclerosis, as well as in patients with combined arterial and venous ulcers. 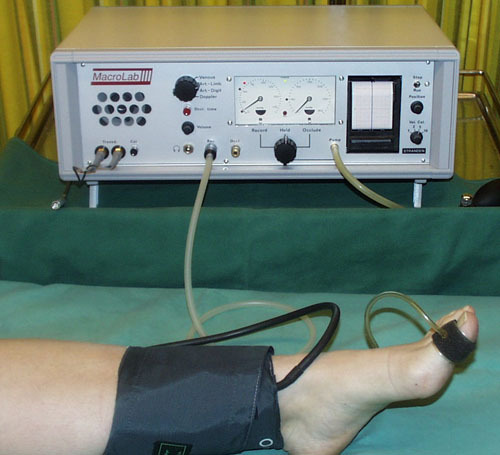 The unit is a low-cost alternative to the laser doppler method of measuring toe pressure. 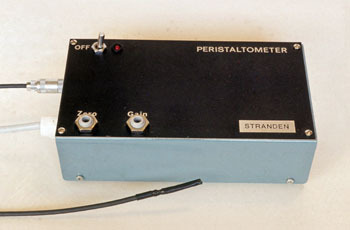 Peristaltometer. This unit was developed to detect peristaltic movements in the stomach wall, investigated via the working channel of a gastroscope. PresRes Monitor. This device detects peripheral runoff resistance, which may be of interest in patients with distal atherosclerotic disease who are in need of arterial revascularisation. 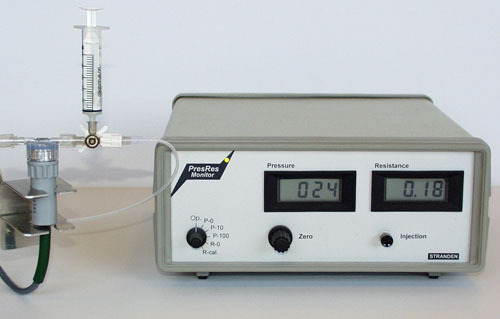 The working principle is integrating (by an inbuilt analogue computer) the runoff pressure when a specified amount of fluid is injected into the runoff tree during a preset time interval. This method simplifies the calculation of runoff resistance and eliminates the need for blood flow estimates. Pressure Monitor. 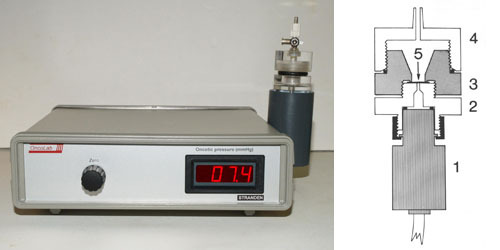 Pressure monitors are produced in a variety of formats according to the various needs. Below is the one-channel version depicted. 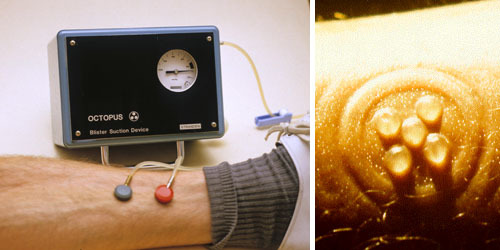 The Pressure Monitor may be used to measure blood pressure within arteries or veins, or, as shown below, the tissue pressure in subcutaneous (or intramuscular) tissue. 2ch. 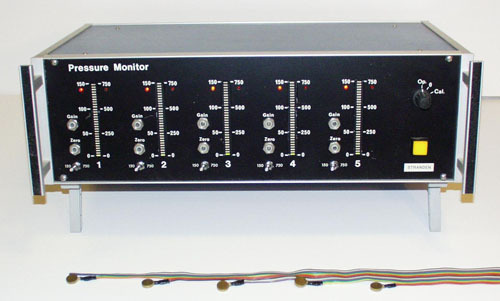 Pressure Monitor. 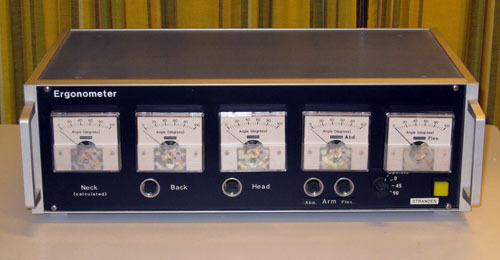 Two-channel versions may have an additional difference-pressure output, like the one illustrated below. 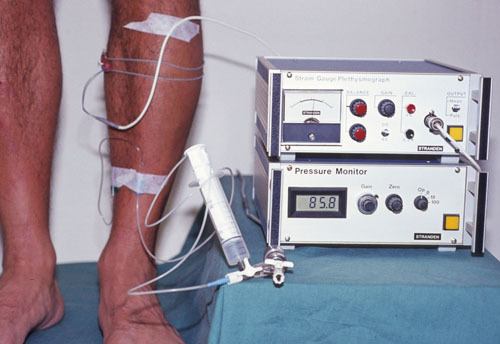 This unit was developed to simultaneously record the ambulatory vein pressures in foot and calf veins, which illustrated a pressure gradient along the leg veins. These findings have great impact on investigations for venous insufficiency. 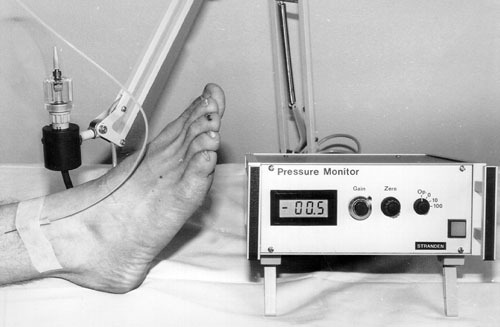 The pressure monitor below was designed to measure the pressure gradient underneath the leg bracing in patients with functional leg support bracing following leg fracture. The device may also be used in evaluating the pressure gradient in compression leg stockings. 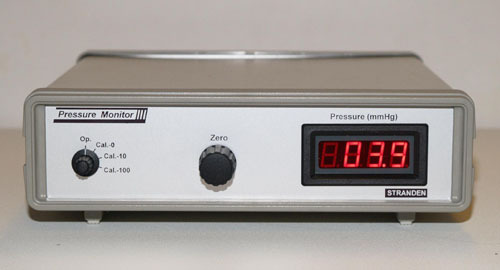 Strain Gauge Plethysmograph shown on the top of the pressure monitor in the photo below is based on mercury in silastic strain gauges that can be applied on extremities. 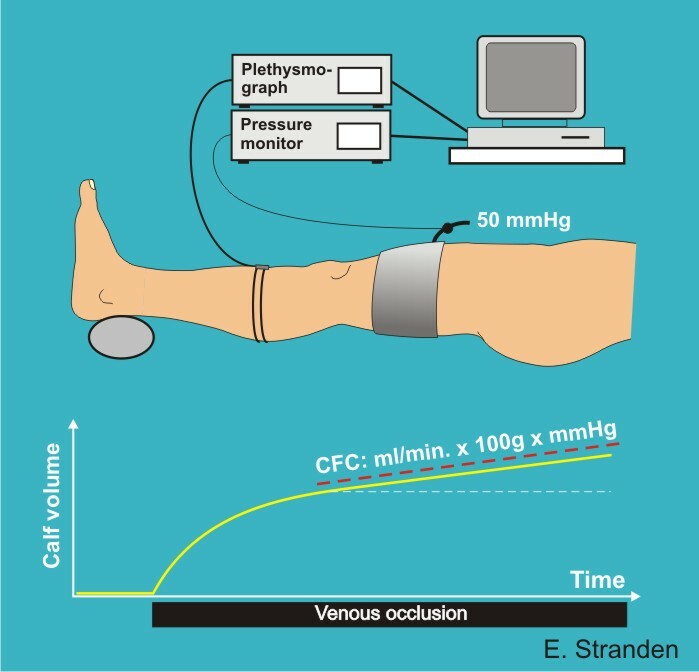 This unit provides calibrtated recording on volume changes, either pulse synchronous pulse waves (PVR) or in conjunction with provocations such as venous occlusion, and may then quantitate parameters as calf blood flow or capillary filtration coefficient (CFC). In the current photo the units are recording venous function during walking (testing for venous insufficiency). 5 ch. 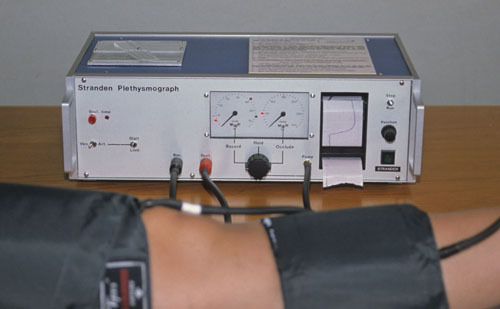 Photo Plethysmograph was developed in collaboration with MSc. 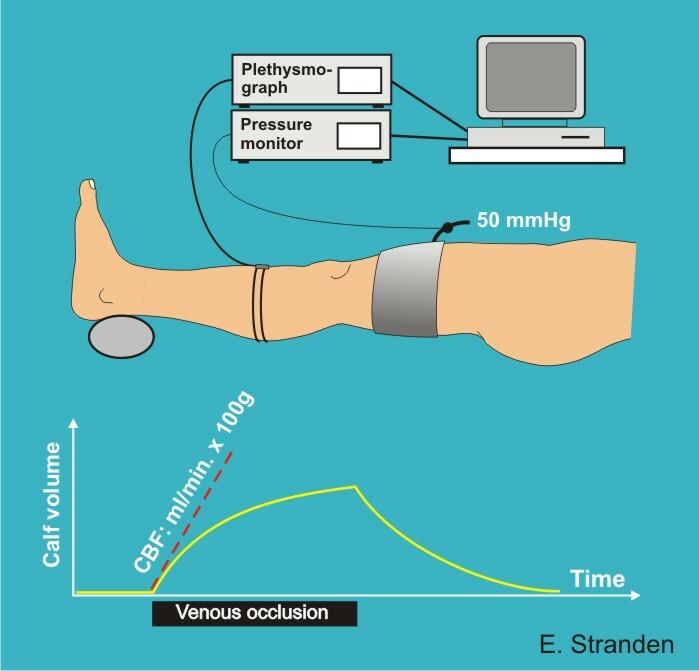 Arne Grip to record the skin microcirculation on several locations (up to five). It also has incorporated ECG-amplifier, pressure amplifier (to record digital arterial pressure) and a skin temperature recording unit. 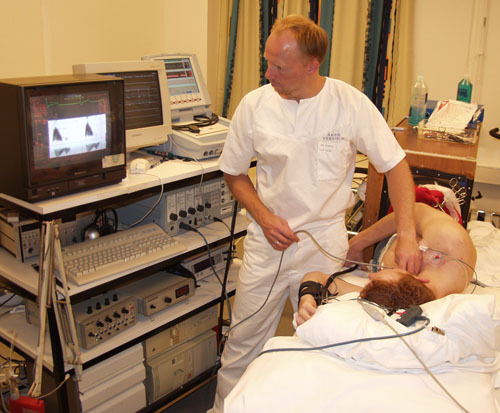 The photo illustrates the setup for supraorbital testing of the blood flow in the neck arteries (arteria carotis interna/externa). Ergonometer. This unit was developed to continuously measure the body angles during work. The rationale behind this unit was that measurement of neck- and arm angles could be used in assessing the work load in industrial work-places, instead of EMG from selected muscle groups. The technique recorded neck angle (difference between head- and back angles), arm flexion and arm abduction, and was found useful in quantifying work loads, compared to muscle EMG. 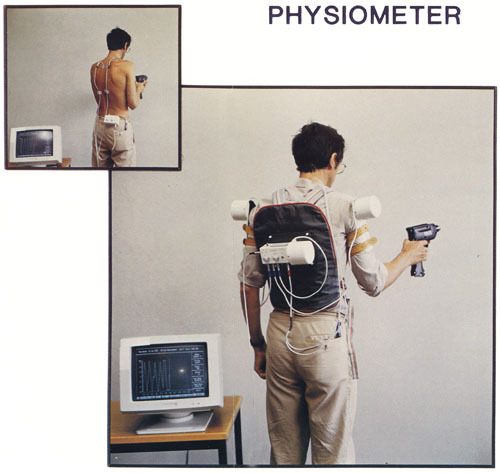 The field studies were promising, the Ergonometer was refined, the technique digitized and computerized. Together with two partners we established the company Premed AS (Preventive Enviromental Medicine, and the developed Physiometer was distributed to universities and reseach establishments worldwide.